A GLORIOUS opportunity to experience – both audibly and visually – the sparky, voltaic intensity of pianist Michael Wollny’s current trio, limited CD + DVD collectors’ edition Klangspuren (sound/feel) captures the excitement of two enthralling concerts from Hamburg and Leverkusen. Described by ACT Music founder Siggi Loch as a long-standing “creative pillar” of the label (especially in the wake of the tragic, untimely death of Esbjörn Svensson), Michael Wollny has steadily grown in stature as a particularly intelligent musician. The extraordinary breadth of his original Weltentraum album, for example, was cleverly themed around the words or music of song/’lied’; and his pianistic approach is equally diverse, balancing heavy, tumultuous attack with dark, nocturnal serenity and suspension. Taking material chiefly from the Weltentraum and Nachtfahrten studio albums of 2014 and 2015 respectively – and with DVD footage capturing the kind of verve found in 2014’s Weltentraum Live CD – Wollny and his colleagues Christian Weber (bass) and Eric Schaefer (drums) deliver typically seductive atmospheres which are a joy to be drawn into. As well as an accomplished composer, Wollny is historically a master arranger – and opening this recorded Hamburg set on CD, he elevates Angelo Badalamenti’s Questions in a World of Blue (from Twin Peaks, originally sung by Julee Cruise) into achingly measured, Bachian loftiness, complemented by Schaefer’s re-working of Guillaume de Machaut’s 14thC motet De Desconfort before the trio unfurl their percussive wings in his own Motette No.1 – and any similarities between Wollny and Svensson in those velocitious, high-end piano improvisations are both exciting and strangely comforting, as if the baton has been naturally passed down. But here is a contemporary jazz beacon with his own, strong pianistic and compositional identity, the melodic pop-catchiness of his When the Sleeper Wakes erupting magnificently to the trio’s combined clamour, double-time snaps and often unpredictable progression. Rising out of a lugubrious, solidly-beaten death march, Nachtfahrten‘s sustained, intensifying weightiness can be quite affecting, eventually suggesting arrival at the brilliance of a morning sunrise; Schaefer’s Arséne Somnambule perpetuates the nocturnal theme, its panicky central perambulations imagining a sleepwalk to quickly erase from memory; and the vibrant interplay in such storytelling remains consistently engaging. White Moon (from the pen of one of the pianist’s early teachers, Chris Beier) is appropriately delicate as it shimmers to internal strings and muted percussion/bass, whilst Wollny’s arrangement of Alban Berg’s Nacht – with pleasing, jarring motifs which are instantly recognisable from the Weltentraum releases – is thrillingly executed by this thunderous, three-piece wall of sound; and the restrained beauty of seven-minute original, Der Wanderer – with a Mussorgsky-like solidity in places – might dispel any traditional preconception of the jazz piano trio format (a composition to lose oneself in). The accompanying live DVD opens a window on the detail and passion of Wollny and his trio. Multi-angled, and allowing an intimate, over-the-shoulder view of Wollny’s technique, it also highlights the trio’s rapport. At the ferocious peak of numbers such as Phlegma Fighter and When the Sleeper Wakes, the pianist’s artistic bravura is mesmerising to witness, his most extreme flamboyance sometimes sacrificing accuracy for dynamic effect (wonderful to see); yet, the contrasting limpidity of Lasse! and delightful Little People, with the satisfaction of scrutinising all three instrumentalists’ individual subtleties, is just as rewarding. Klangspuren is available from ACT Music – and ‘limited’ edition may well be pretty accurate. So don’t miss this feast for ears and eyes. 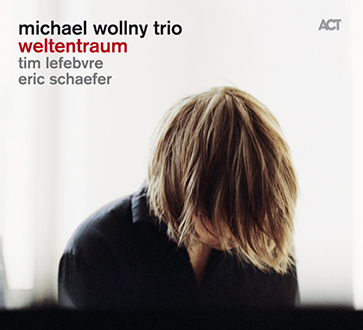 SEVERAL MONTHS AGO, German pianist Michael Wollny released outstanding jazz piano trio album Weltentraum (Dream World), taking ‘lied’ as its theme. With a new line-up – Tim Lefebvre (bass) and Eric Schaefer (drums) – the studio recording was met with critical acclaim across the international music media for its intelligent, inventive sequence of song-based interpretations, as well as its excitingly fresh, flawless delivery (AP Review here). Wollny has been on the scene with Siggi Loch’s ACT Music label for some ten years now, garnering countless awards for his burgeoning catalogue of recordings, not least (with Weltentraum) four stars in US magazine Downbeat and a place in the Top 50 pop album charts. In March, during the trio’s 2014 Jazznights tour, Loch decided to record their gig in the Chamber Music Hall of Philharmonie Berlin; and, citing Wollny as the “creative pillar of the ACT family” who inspired him to carry on after the tragic, untimely death of Esbjörn Svensson, the performances here exude, at times, a similar spine-tingling energy and spontaneity to that of e.s.t.’s inspired double Live in Hamburg release of 2007 (ACT 6002-2). Featuring extended development of six tracks from the studio album – along with two scintillating new works by drummer Schaefer – the whole fifty-five minute Weltentraum Live experience is excellently captured and clearly appreciated by an enthusiastic audience. Here, the nocturnal mystery of Alban Berg’s Nacht is afforded more space for improvisatory elaboration; and Hindemith’s Rufe in der Horchenden Nacht comes alive with an enhanced, glowing timbre, Lefebvre’s fluent, rasping bass matching Wollny’s range of skittering high lines and impressionistic iridescence. Phlegma Phighter (Schaefer’s vigorous, bustling eleven minutes’ worth) is a fantastic, contrasting showcase for the trio – one minute, thunderously heavy; the next, displaying a ‘deafening tranquillity’ before blazing red hot at the invitation of the writer’s snare fanfare. These ingenious twists and turns might invite comparisons with, say, The Bad Plus or Phronesis – but Wollny is his own man, whose distinctive pianistic character very much shapes this trio; his own pop-infused When the Sleeper Wakes shines all the brighter thanks to the crackling impetus of bass and drums, which Wollny clearly responds to. Eric Schaefer’s beautiful, contemporary reworking of Guillaume de Machaut’s 14th Century Lasse! holds the breath with Gustavsen-like reverence (no doubt the Philharmonie gathering were similarly spellbound); and Wollny’s dark-edged Engel grooves to the gruff, distorted bass of Lefebvre, leading directly to Gorilla Biscuits (now, there’s a title! ), an absolute masterpiece which pushes each player to the limits, carefully synchronised but also clanging with extreme and quite physical extemporisation (triggering huge applause). To close, the trio’s delectable, almost levitational reading of Jon Brion’s charming song, Little People – quietly irresistible, and all the more wondrous in this live setting. Released in the UK on 13 October 2014, the heights that the Michael Wollny Trio are currently scaling might pose a dilemma in choosing which of these two recent releases to own – studio or live? For the sheer magic of it all, I offer a single recommendation – BOTH! THE ART OF the jazz piano trio has undergone something of a renaissance over the past couple of decades, advancing so much more on the traditional expectation of Real Book pianist supported by drums and bass rhythm section. One only needs to look at the trailblazing achievements of Django Bates, Kit Downes and Phronesis, the seminal work of Esbjörn Svensson and, more recently, the rising interest in newcomers GoGo Penguin to understand that the format is travelling in increasingly more creative, vibrant and exciting directions. The provenance of the fourteen numbers could hardly be more ingeniously varied and considered, Wollny and Schaefer producing remarkable acoustic trio arrangements of numbers from The Flaming Lips and Pink to Paul Hindemith, Wolfgang Rihm, Alban Berg and Guillaume de Machaut, as well as a couple of originals from the leader – yet the entire concept holds together so brilliantly. And, for all its inventiveness and interest, the music contained within these fifty-five-plus minutes, regardless of its origin, is consistently accessible and, I find, profoundly engaging. For example, Eric Schaefer takes a 14th Century motet – de Machaut’s Lasse! – and transforms it into a gently shimmering, ebbing contemporary tune. With a deliciously bendy bass intro, Peter Ivers’ song, In Heaven (from movie Eraserhead), becomes a wide, flamboyant blues; and Be Free, A Way exchanges its psychedelic electronica for driving jazz/rock with a smattering of Gustavsen-like restraint. Rihm’s Hochrot (usually for soprano or tenor voice) maintains the original’s unsettled beauty, again Lefebvre’s bass integral to the whole pellucid reading; and whilst the words and music of Jon Brion’s Little People are already too beautiful, the song transcribes magically for jazz piano trio. Amongst all this are Michael Wollny’s own compositions – Engel, a dark, smouldering affair; and When the sleeper wakes, whose pop-song groove is illuminated by characteristically sputtering piano soloing. And so the wonderful reinterpretations continue, the added spin-off being that they spark further personal discovery (Hindemith or The Flaming Lips might well be my next stop!) – and I positively recommend the whole ear-opening experience. The trio’s ensemble and individual performances are exceptional throughout, and the recording both bright and immediate. 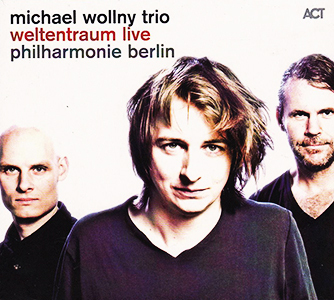 Released on 10 February 2014, ‘Weltentraum’ is available from ACT Music, as well as iTunes and usual outlets; the trio begins a short UK tour on 29 April 2014 (see below).